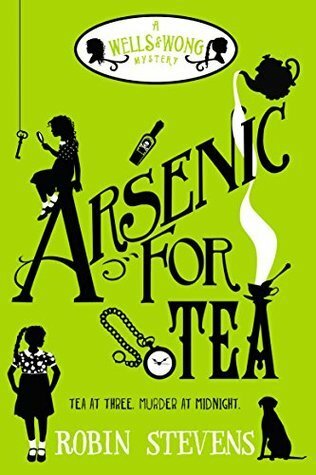 Presenting Wells and Wong #2 Arsenic for Tea by Robin Stevens. Our joyous pair of school girl detectives Daisy Wells & Hazel Wong are back for another spiffing case. Its the holidays and they (Daisy & Hazel) are at Fallingford, Daisy's home for her birthday. Invited are family, friends and few extras for a birthday tea. And one of the lot doesn't see the light of the next day/ With storm raging and floods setting in, home suddenly feels much more dangerous. No matter the consequences or the suspects involved, Wells & Wong must find out the killer before something bad happens. Robin Stevens really did wonders to these two girl. Just like 'Murder Most Unladylike', the Detective Society has taken to detecting again because the adults are keeping big secrets and the suspect likely points to someone close. Of course Hazel's running commentary is welcomed again and appreciated as she compares the quirks of her own home to those of Fallingford and high strung Daisy who must battle her own fears to do what is right. Despite the stark differences in their appearances or country, these two best friends make a stellar pair. The brash English Rose (Daisy) and the voice of reason (Hazel). A tighter mystery than before, the detective society must sniff out who ruined the tea party and save the day again. "A new and equally knotty case close to home for our audaciously bold school girl detectives Well & Wong"